My curiosity about the Victorian and Edwardian architectural heritage of Bray was stimulated at the weekend as I explored the history of the former Presbyterian manse on Quinsborough Road and the neighbouring church. The manse and the church predate Quinsborough Road, which runs from the Main Street to the Railway Station, and which was laid out in 1854 by William Dargan, the great railway pioneer who had a vision of bringing the railway to Bray and laying out the town as a fashionable Victorian resort. I returned to Bray on Sunday afternoon to explore the sites of two buildings that are part of the lost Victorian and Edwardian streetscape of Bray – the once elegant Turkish baths, and the long-lost International Hotel, both on Quinsborough Road. A non-descript, late 20th century shopping centre on the north side of Quinsborough Road stands on the site of the former Victorian once elegant Turkish baths. Turkish baths became a fashion in Victorian England and Ireland and were introduced to Ireland in the mid-19th century. The Victorian baths were supposedly modelled on ancient Roman baths and relied on a flow of dry air rather than moist air in the series of progressively hotter rooms. The therapy was recommended for rheumatism, gout and tuberculosis. The first Victorian Turkish bath in Ireland was opened at Saint Anne’s Hill, Blarney, Co Cork, in 1856 by Dr Richard Barter (1802-1870), a Cork-born and London-trained medical practitioner. An interest in ‘Orientalism’ and a fascination with the exotic dimensions of the Turkish and Arab world had been stimulated in English-speaking Victorian fashionable society in the decades immediately after the publication of Washington Irving’s Tales of Alhambra in the mid-19th century. It was first published in 1832 as The Alhambra: a series of tales and sketches of the Moors and Spaniards and a more popular version was published in 1851 as Tales of Alhambra. Barter’s interest in Turkish baths was aroused by an account in The Pillars of Hercules (1850) by the Scottish diplomat David Urquhart. He decided to establish a Turkish bath at St Anne’s, Blarney, Co Cork, and invited Urquhart to supervise its construction. This was the first Turkish bath in the British Isles and the foundation stone was laid on 7 June 1856. That year too, Barter sent his architect nephew, also Richard Barter, to Rome in 1856 to study the ruins of old Roman baths. Among the first people to enjoy Barter’s new baths in Blarney was the railway pioneer William Dargan (1799-1865) from Carlow, who was involved in laying out Bray as a fashionable seaside resort in north Co Wicklow, accessible by train from Dublin, long the lines of places such as Blackpool, Brighton, Eastbourne and Weston-super-Mare in England or Beaumaris and Llandudno in Wales. Dargan had brought the railway to Bray, and in the 1850s he opened up Quinsborough Road to link the Main Street with his new railway station and his planned promenade along the seafront. At that time, he commissioned architects to build three new elegant terraces of house on Quinsborough Road, and invited Barter to build new Turkish baths on this new road. The new Turkish Baths in Bray were ‘built under Dr Barter’s direction and ... under his management.’ Barter took out a patent for his system in 1859, and he opened his new Turkish baths in Bray that year. 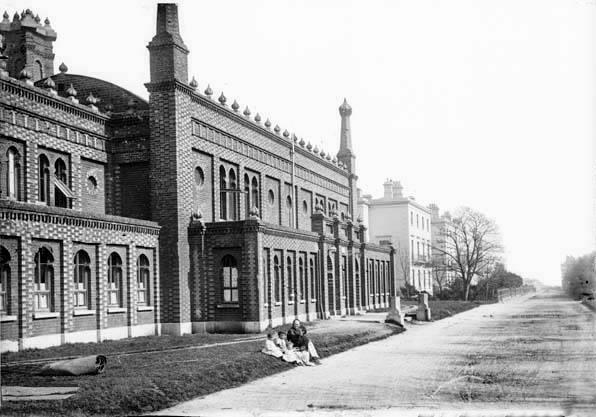 The Turkish baths in Bray were built in an extravagant Moorish style and cost Dargan more than £10,000 to build. They were opened by the Earl of Meath, the principal landlord in Bray, on 15 October 1859. The exterior was designed by Sir John Benson, but other architects involved in the project included Barter’s nephew Richard Barter (1824-1896) and Edmund William O’Kelly, who later built the International Hotel nearby. Sir John Benson (1812-1874) was the Cork City Engineer and was the architect of the Great Industrial Exhibition on the lawn of Leinster House in Dublin in 1853. Benson worked closely with Dargan on pioneering the railways in Ireland, and was involved in railway building in the Cork area, including the Cork and Macroom Railway, the Rathkeale and Newcastle Railway, the Cork and Limerick Railway, the Cork and Passage Junction Railway, and the Cork and Kinsale Railway. The interior was designed by Barter’s nephew, also Richard Barter (1824-1896), who designed similar establishments elsewhere in Ireland. 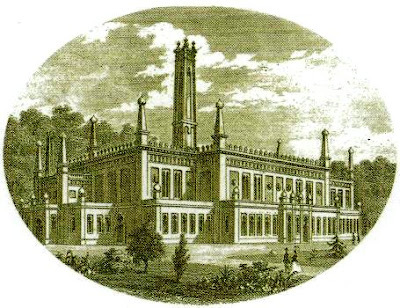 Richard Barter is also said to have designed the external appearance of Turkish baths in Lincoln Place, Dublin, and similar establishments in other places in Ireland for Dargan. The main entrance was onto Quinsborough Road, with side entrances at either end to the east and west wings. At the back of the baths, a 70 ft ornamental chimney discharged the fumes from the coke-fed furnace. Inside, there were several rooms adapted for different uses, with a grand entrance hall, and a dozen small apartments off the hall, each fitted as a dressing room with couches and divans. The ceilings were painted in arabesque patterns, and richly coloured with Turkish patterns of green red, and blue, and the windows were of coloured glass. At the centre there was a marble fountain surrounded by flowers, aquatic plants, ferns, shells and rock-work. The pavements and tiles were made at Minton’s Works in Staffordshire and imitated the pavements of ancient baths. Attendants in Turkish costumes shampooed the bathers and offered coffee, sherbet, cigars and pipes. The baths were open from 6 am to 11 pm, except on Sundays, when they were open for five hours. There was a choice of public or private bathing, at charges of two shillings or three shillings respectively. Shampooing cost an extra 6d. Two months after his Turkish Baths opened in Bray, Dr Barter also opened Turkish baths in Lincoln Place, close to Trinity College, in February 1860. Barter soon other Turkish baths in other towns and cities, including Donegall Street and Arthur Street, Belfast, Grenville Place and Maylor Steet, Cork, Killarney, Charles Street, Limerick, Finisklin Road, Sligo and South Parade, Waterford. Like the baths in Bray, most were purpose-built and in what was described as a Moorish style. In 1860, GR Powell, devoted several pages in The official railway handbook to Bray to his visit to Bray’s ‘improved Turkish, or new Irish baths’. But a controversy about the supposed benefits of the baths raged in the medical press from 1860 on. But the Turkish baths in Bray were never a success. Summer attracted many visitors to Bray, but the resort attracted fewer visitors from Dublin in winter, and Dublin residents found Barter’s Turkish baths in Lincoln Place were more accessible. In the winter of 1862, bathers in Bray were offered free entry, and by 1864 Dargan was trying unsuccessfully to sell the baths for £4,000. Dargan died in 1865, and the baths were closed by 1867, when a new company converted the building into assembly rooms for concerts and other entertainment. The new premises opened in July 1867, and for a time also served as a Quaker meeting house. However, Dr Barter returned and reopened his Turkish baths in one of the wings, using some of the original small bath rooms and facilities. The baths had closed again by 1869, and Barter died in 1870 at the age of 68. Some of his baths continued to offer for a few decades after his death, including those in Charles Street, Limerick, until 1886, and in Lincoln Place, Dublin, until 1899. AS well as minarets, Barter’s baths in Lincoln Place, Dublin, also had a dome, and are referred to by James Joyce in Ulysses, where Leopold Bloom describes them as ‘the mosque of the baths.’ But these baths had closed in 1899, five years before Leopold Bloom’s odyssey, so Bloom could not have availed of their facilities. By 1877, the Turkish baths in Bray were described as ‘a perfect eyesore.’ Around 1900 the exterior was rendered and the brick patterns were obliterated. In the early 20th century, the building it became a cinema, and part of the building was also used as a Quaker Meeting House. By the time I first saw it as a teenager in the 1960s, the building was derelict. Schoolfriends tried to convince me it was Ireland’s first mosque. The building was vacant and crumbling by the time I was working for the Bray People in the mid-1970s. The building survived until 1980, when it was demolished to make way for a small shopping precinct. The building that once housed Barter’s baths in Lincoln Place, Dublin, was used for a variety of commercial purposes until it was demolished in 1970. During my two visits to Bray last weekend [12 and 14 August 2016], all the office space on the first floors appeared to be vacant, and the site has none of the exotic, oriental appeal I remember of Dr Barter’s former Turkish Baths. Mary Davies, ‘A lost Victorian treasure – Bray’s Turkish Baths,’ Journal of the Bray Cualann Historical Society 5 (2004), pp 12-18. Mary Davies, ‘Bray’s Turkish Baths,’ History Ireland, Vol 15, No 6, November-December 2007. Mary Davies That favourite resort: the story of Bray, Co Wicklow (Bray, 2007).